Heavenstrike Rivals (Free) is out and is one of the newest forays Square Enix has made into making mobile focused titles. Relying on a number of market-proven mechanics, Rivals doesn’t break a lot of new ground. It does, however, manages to impress with it’s mastery of the familiar. This is Squeenix we are talking about after all. If you saw one of those 5 sentence reviews that seem to be gaining popularity in the iOS-sphere, it might consist of a comparison to the hero gathering aspect of Defender of Texel (Free) or Puzzle and Dragon (Free) with the game play of Megaman Battle Network. It would follow with a short lament of the existence of the much maligned energy system that prevents you from binging out. It might continue the rant with a mention of the pay to win style shop with very powerful heroes available if you shell out enough cash to continue rerolling. 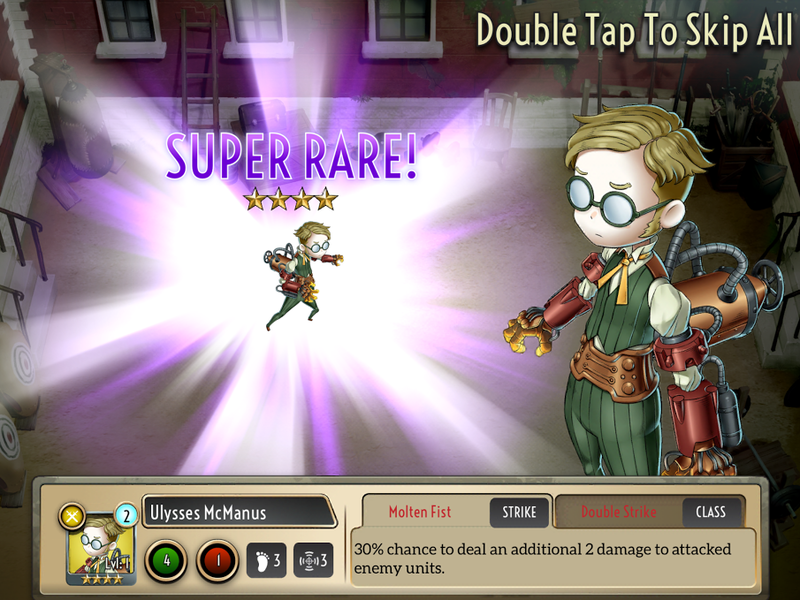 After throwing the game a bone for the square staples of steampunk and airships it would probably wrap up with a nod to the pvp and a quick star rating. I’m pretty happy I can actually elaborate a little and express some attention to detail, so here I go. In Heavenstrike Rivals, you are trying to prevent the world being overrun by evil monsters that are descending chains that hold the continents up suspended in air. Yes, the continents of the world your character lives in are suspended in mid air via chains that hang down from…. clouds I guess? It’s interesting if not a little implausible. You are thrust quickly into combat on a turn based board, most of which are 3×8 square grids. 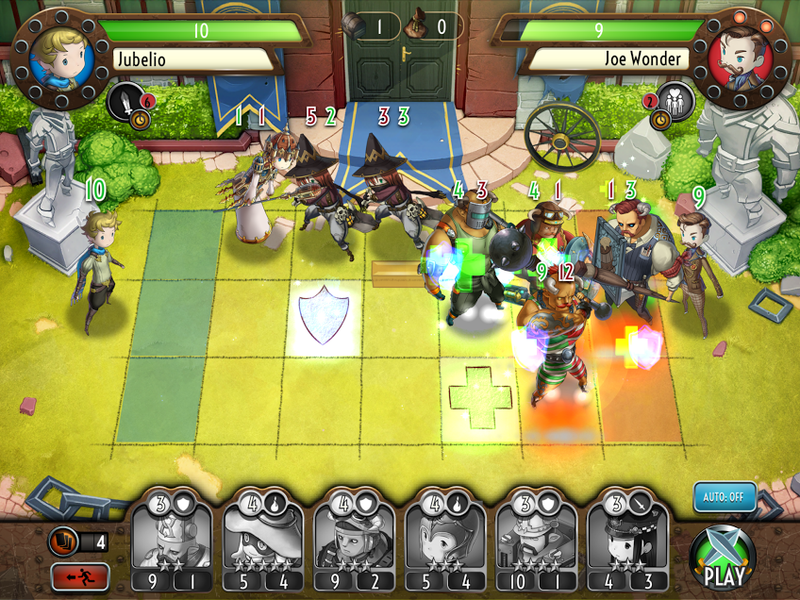 You gain 2 mana each round up to a maximum capacity of 10 and can spend it to deploy units on the board. As long as a unit is alive and deployed, it holds onto the mana you spent to deploy it. Once one of you units dies, you regain that mana and are free to use it to summon something else. On one end of the board your character stands with 10 hitpoints and on the other end, your opponent usually with 10 as well. The first to lose all hitpoints loses the match. Generally speaking, the more rare a unit is, the more complicated and devastating their abilities are. Warcy abilities are executed before a round, as soon as you deploy a unit. Strike abilities are, strangely enough, triggered when a unit attacks. 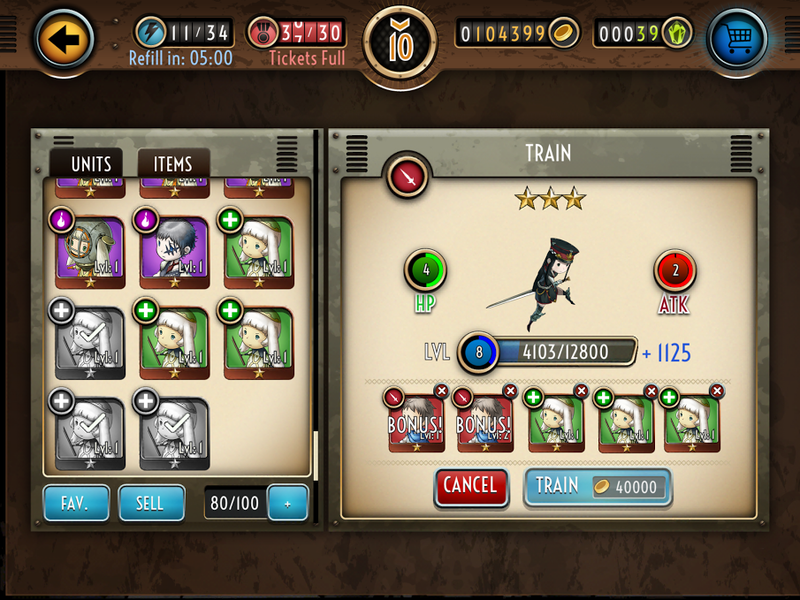 Once you finalize your deployment, your units will advance forward the amount of their move attribute or stop when they are adjacent to an enemy. If an enemy unit or the opponent himself/herself is within attack range, your unit will attack. Once a unit is on the gamefield, the only control you have over them is the ability to move them from one lane to another before they advance. This can be done as long as they are not immobilized or taunted and locked into a lane. Eventually you will either defeat the enemy team and kill off the opponent or you will get overwhelmed and lose. Only in pvp can you get a tie decision for a match taking too long. Theoretically you could double K.O. the last 2 units with a poison attack, but I didn’t run into that minority case. Like I said in my fake 5 sentence review, gameplay is very heavily based on Megaman Network, and also the amazing Calculords (Free). Heroes are grouped into 6 archetypes, mage(aoe multi-row ranged attacks), priest(heals and weaker ranged attacks), sniper(line aoe attacks), scout(fast/multiple strikes), defender(taunts/high health) and warrior(attacks stack +1 strength). Each of these has a base ability as well as one more or less unique ability based on the rarity of the hero. After playing for an hour or so, you’ll probably have enough interesting units to warrant a trip to the team manager screen and set your squad up. The black mage that is being handed out for free currently is your first taste of how powerful a minion can be. Their warcry deals 2 damage to everything and reduces the attack of anything left alive by 2. If you get a unit stronger than the black mage, consider yourself lucky. There are a few ways you can acquire new people to fill out your squad. Once you get 45 gems you can random roll 10 additional units, and from my experience your chances are decent of getting at least 1 or 2 super rare units. Initially you get gems quickly, but acquisition slows down to 2 per story line quest completed. There are also PVP tournaments with rewards for those that can successfully place near the top of their group. PVP matches function much the same as normal matches, but have a 60 second time limit per turn. The tournaments have some pretty cool rewards, but take multiple weeks to get the best units as rewards. I have been enjoying the game’s simple, but clearly Final Fantasy influenced visuals. The rare and super rare characters that you are most likely to build a team around are colorfully adorned and each has a personality of their own. The game is not exactly graphics intensive, but it comes packed with a pretty large amount of load time. That, in conjunction with the heavy tax it puts on the battery of my iPad, makes me think that optimization may have not been at the top of the priorities list with this app. After playing a few combats, I get tired of the constant load screens back and forth between everything. I see Heavenstrike Rivals as a mobile game that just happens to have connections in console gaming. It would be cooler if it were the other way around and we had a console gaming experience that just happened to be on mobile. It’s a shame that load times, energy bars, and currency locked super units cast a shadow over the gameplay, but despite that I still have had a good time playing the game. For anyone who doesn’t immediately get triggered by energy systems and with a few engine optimizations, I could see Heavenstrike Rivals as an easy 4 star game. In the meantime, it’s still worth a download for turn-based tacticians like me.